Photosynthetic organisms have evolved ingenious ways to collect solar energy and funnel it to the business end of the fuel-producing apparatus, where electron transfer takes place. The efficient harvesting of sunlight by plants and photosynthetic bacteria is facilitated by organized assemblies of chlorophyll (or bacteriochlorophyll) molecules which are tuned to absorb particular wavelengths of light. These pigments are held together not by covalent bonds but by intermolecular interactions, and the structure may or may not be enforced by a protein scaffold. The spectra and structure of the TCPP aggregate depend on whether the counterion is nitrate (a) or chloride (b) ion. From “Counterion-Dependent Dye Aggregates: Nanorods and Nanorings of Tetra(p-carboxyphenyl)porphryin,” Stephanie C. Doan, Saravanarajan Shanmugham, D. Eric Aston, Jeanne L. McHale, J. Amer. Chem. Soc. 2005, 127, 5885-5892. Many synthetic pigments provide models of natural light-harvesting complexes through their tendency to self-assemble into organized structures with altered electronic and optical properties compared to the parent monomers. Better understanding of the link between aggregate structure and electronic and optical properties is needed in order to exploit these fascinating nanostructures in devices which capture and use solar energy. Also of great interest is how the assembly depends on the environment, e.g. solution phase, nanostructured template, or protein scaffold. And one would like to know what molecular structural details (hydrogen-bonding, pi-stacking, metal-ligand coordination, etc.) control the ultimate morphology of the assembly. 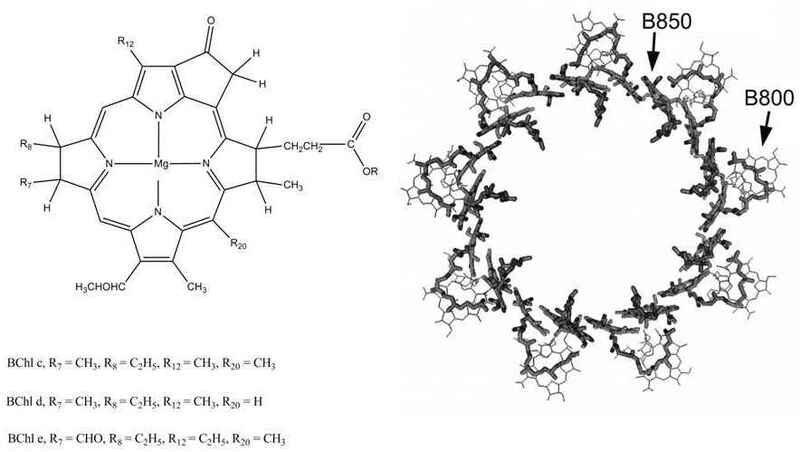 As shown above in the case of tetracarboxyphenylporphyrin, a mere change in counterion can make the difference between the formation of nanorods or nanorings. Assembly of TSPP diacid monomers (H2TSPP2-) (a) into cyclic N-mers (b) held together by electrostatic forces results in a splitting of the degenerate Soret band of the porphyrin into red-shifted (c) and blue-shifted (d) transitions polarized parallel and perpendicular to the plane of the ring, respectively. Assembly of these N-mers into a helical nanotube can be envisioned as the folding of a hexagonal array (e) into a helical nanotube, (f) imaged as a flattened tube (g) 4 nm in height and ~25 nm in width. From “Light-Harvesting Chromophore Aggregates and Their Potential for Solar Energy Conversion,” Jeanne L. McHale, invited Perspective. J. Phys. Chem. Lett. 2012, 3, 587-597. Working with the well-known aggregate of tetrasulfonatophenylporphyrin (TSPP) and in collaboration with Ursula Mazur, we made the surprising discovery that the internal structure of the TSPP aggregate is not at all similar to that of the standard “staircase” cartoon of a J-aggregate. The McHale lab has put forth an alternative model of the hierarchical structure of the TSPP aggregate in which the assembly process can be envisioned to take place in two steps, as shown above. First the monomers in their protonated (diacid) form are driven by electrostatic forces to assemble into discrete rings (cyclic N-mers, where N is believed to be on the order of 16) about 6 nm in diameter, not unlike the light-harvesting aggregate of purple photosynthetic bacteria. 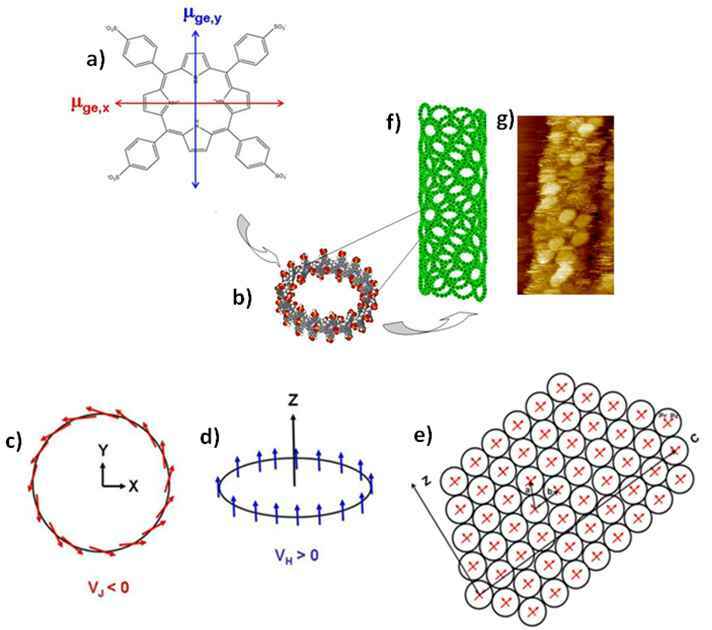 These rings are then held together by water mediated hydrogen bonds which direct the folding of a two-dimensional hexagonal array of rings into a hollow nanotube. A series of resonance Raman spectroscopy experiments in our lab performed by Chris Rich (PhD 2013) has thoroughly exercised this model and provides the basis for understanding the unique optical properties of TSPP aggregates. a) optical spectra, b) resonance Raman spectra, and c) resonance light-scattering spectra of TSPP-d and TSPP-h, the TSPP aggregate prepared in deuterated or protiated water, respectively. One of Chris’ most interesting discoveries was that the electronic communication (“excitonic coupling”) of the TSPP aggregate is different for TSPP dissolved in normal water, H2O, with HCl versus heavy water, D2O, with DCl. In the latter environment, the protons on the pyrollic nitrogens are replaced by deuterons. As shown above, there is only a slight effect of deuteration on the optical absorption spectrum of the aggregate, but the relative and absolute resonance Raman intensities, and the intensity of resonance light scattering, are greatly altered. The optical spectrum consists of a red-shifted Soret band (called the J-band) and a blue-shifted one (the H-band). The J-band evidences exchange narrowing that results from the delocalized excited electronic state. The enhanced light scattering of the TSPP aggregate in deuterated environment (TSPP-d) compared to the protiated system (TSPP-h) reveals that the excited state is more delocalized in the former. These results suggest that exciton-phonon coupling limits the coherence of the excited state. This exciton-phonon coupling is larger for the protiated aggregate system, as revealed by the larger relative Raman intensities of low-frequency out-of-plane vibrational motions of hydrogen atoms. The larger amplitude of the hydrogen atom vibrations limits the coherence of the excited electronic state. Our results show that the J-band is a superposition of two closely-spaced electronic transitions. These two transitions result from the splitting of the N-mer exciton into transitions which are polarized parallel and perpendicular to the long axis of the helical nanotube. The model shown above explains a large number of previously conflicting literature reports on the TSPP aggregate, such as the incomplete polarization of the J-band transition in aligned samples. Resonance Raman spectrum of the TSPP aggregate in solution (left, the monomer diacid spectrum is shown in the inset) and that of a single aggregate deposited on glass (right). The false color images of the individual aggregates arise from resonance light scattering at 488 nm. Disorder limits the delocalization of the excited electron state, and there is much evidence that aggregation of TSPP is heterogeneous. As part of his PhD thesis, Chris Rich used resonance Raman microscopy to obtain the first single aggregate spectra and images of TSPP dispersed on glass. Single-molecule, or in this case single-aggregate, spectroscopy enables the role of heterogeneity to be explored and provides structural insights that are obscured in ensemble spectroscopy. In these challenging measurements, Chris found that Raman intensities are different for different aggregates and for the same aggregate excited at different spots. Also, as shown above, Chris used measurements of the absolute Raman cross-sections of the aggregate and monomer in solution to show that aggregation results in tremendous enhancement of low-frequency vibrations. This effect derives from the fact that out-of-plane vibrational motions perturb the excitonic coupling of neighboring molecules. Also shown above is a single-aggregate Raman spectrum and resonance light-scattering images of individual aggregates. Variations in the intensity of resonance light-scattering along the length of a nanotube result from structural heterogeneity. (Left) Polarized Resonance Raman spectra of an individual TSPP aggregate (Middle) Resonance Raman spectrum of a single TSPP aggregate at low and high incident laser power. (Right) Change in intensities of Raman modes of a single aggregate as a function of illumination time. Two very exciting observations came out of these single-aggregate studies. First, as shown above on the left, Chris was able to use polarized light to excite a single TSPP nanotube with the electric field vector aligned either parallel or perpendicular to the long axis. The observation of significant Raman scattering when the incident electric field vector is perpendicular to the nanotube confirms that the J-band arises from weakly-split helical excitons that have transition moments parallel and perpendicular to the nanotube. In our structural model, this small splitting arises from the relatively weak coupling of cyclic N-mer transition moments when they assemble into the nanotube. 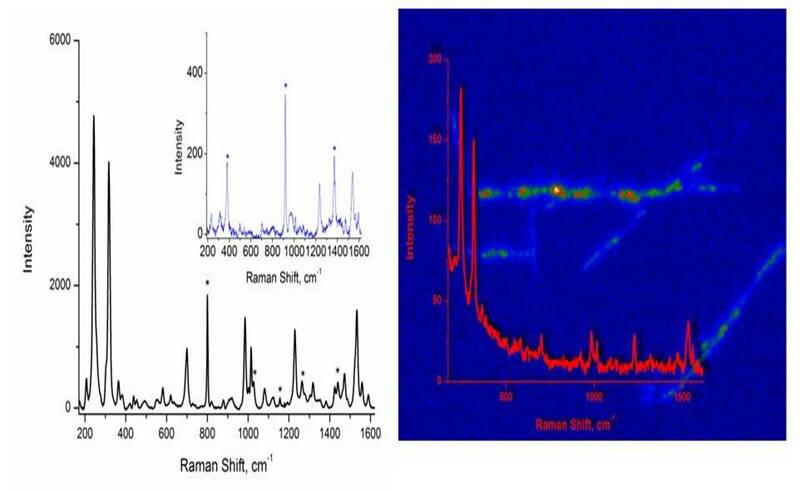 We also found that prolonged laser heating of a single nanotube resulted in a Raman spectrum (above, right) distinct from that of either the nanotube or the TSPP monomer. We conclude that laser heating drives off water molecules that hold the postulated N-mers together via hydrogen bonds.